LONDON: Prime Minister Theresa May asked EU leaders Wednesday for a three-month delay to Brexit amid continued political deadlock in London, but Brussels warned the postponement carried “serious legal and political risks”, reports AFP. Exactly 1,000 days on from Britain’s seismic 2016 referendum vote to leave the European Union and with just nine days left until the scheduled departure date, the divorce deal is blocked in parliament and political turmoil grips the country. Faced with the potentially catastrophic impact of Britain leaving its biggest trading partner with no deal on March 29, May said she would try one last time to pass her deal next week. If it passes, it would still need to be ratified, and she told MPs she has written to EU President Donald Tusk asking to push Brexit back until June 30. If she fails a third time, May said parliament would have to decide what happened next—but said she viewed any longer extension as “a failure to deliver on the referendum decision”. 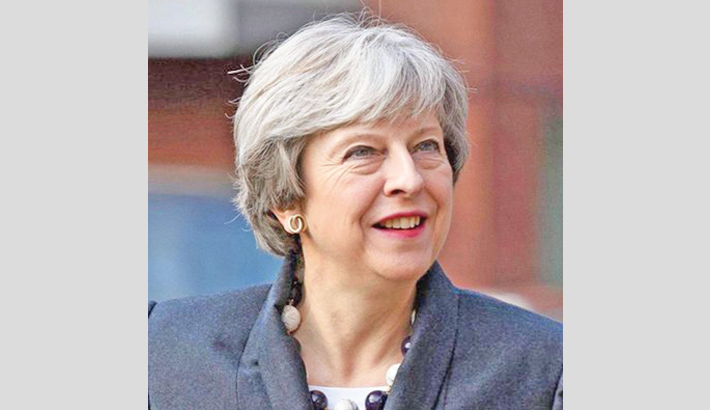 She hinted that her own future was on the line, saying: “As prime minister, I am not prepared to delay Brexit any further than June 30.” And the prospect of Britain having to hold European Parliament elections at the end of May would be “unacceptable”, she said. May will travel to Brussels on Thursday for an EU summit where she will put her request in person to the other 27 EU leaders, who must unanimously approve any delay. But European Commission President Jean-Claude Juncker said it was unlikely they would reach a decision without a clear signal from London on what MPs want, suggesting another meeting might be needed next week. The European Commission, the EU’s executive arm, also warned EU leaders against the June 30 date saying a shorter delay to May 23 or a longer one to “at least until 2019” would be preferable. Her original plan to hold a third vote this week, before the EU summit, was dramatically blocked by Commons speaker John Bercow, who said May could not keep bringing the deal back to MPs without changes. European leaders are now demanding Britain tells them clearly what it wants. “As long as we don’t know what Britain could say yes to, no decision can be taken on our side either,” Juncker told German broadcaster Deutschlandfunk. He said the deal agreed was the final offer, warning: “Nothing more can be done, we’ve reached the end of the road. Juncker said May needed to present Brussels with an agreement approved by parliament as well as “a clear timetable”. Given that this was unlikely before the summit’s start on Thursday, “we will probably need to meet again next week”. Meanwhile, delaying Brexit to June 30 would bring “serious legal and political risks”, the European Commission warned Wednesday in an internal briefing note ahead of an EU summit. Britain has asked to postpone Brexit to that date, but the commission, the EU’s executive arm, urged leaders to choose instead between a short delay to May 23 or a longer one to “at least until end 2019”.